Most people don’t really have a clear vision for what they would like their future life to look like. We often know what we don’t like about our current life (this could be the dreaded 9-5, our health, our finances etc), but we are often not quite so clear about what we do want for our future. A lot of people really struggle with setting a future vision for their life. It can be really hard to see beyond the next couple of months, especially if you are currently struggling with money. But, without a clear vision of where you want to go, how on earth are you supposed to get there? 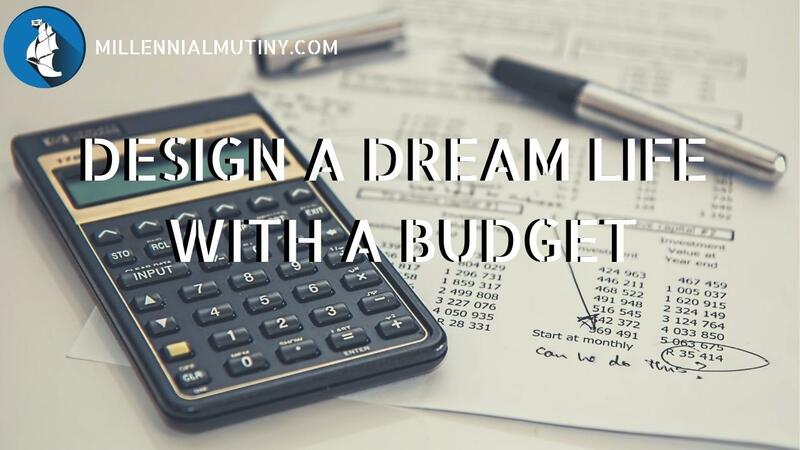 Although life is not all about money, designing a budget for the ‘future you’ living your dream life can be a really easy and accessible way to paint a picture of what you would like your future to look like. First of all, I recommend you start off by adding up what you are spending now in the different areas of your life (you can download my free Master Budget Planner to make this super easy). This will give a good indication of your current lifestyle. You can use these ‘current lifestyle’ spending figures as a benchmark to map across to your dream life. When you know how much things in your current lifestyle are costing, it becomes a lot easier to think about how you would like things to look in the future. Let’s say that you are currently spending around $100 a month on eating out at restaurants. Think about that for a moment. Are you spending all that money on one really nice meal? Or are you eating out at McDonalds 10 times a month? You see how your spending can also highlight issues around your health! Armed with this information, you can then think about how you would like things to look in your ideal life. If you currently eat out once a month at a nice restaurant, perhaps you would like to eat out 3 times a month? Perhaps you would like to eat out 3 times per week? Perhaps you want to eat at nicer restaurants? There is no right or wrong answer here, only what is right for you. Think about what you would like this item to look like in your ideal, ‘money no object’ life. Repeat this exercise for all of your other expenses. Some things won’t change much at all. For example, your property taxes will likely remain identical unless you want to move to a bigger house or a different area. If you do, then go ahead and add in the higher figure (you also better add in the extra money you will need for the house as well while you are at it). Another example might be vacations. Perhaps you currently take 1 vacation a year and you fly coach class at a cost of $3,000. Perhaps you want to take 3 vacations a year and fly 1stclass (nice!). Work out how much your dream holidays will cost and put them in the list as well. When you are doing this, try to be as accurate as you can, but don't spend hours building your dream holiday on a travel site (unless you want to of course). At this stage, we need a solid estimate of how much that holiday will cost, not a detailed breakdown to the penny. You might find that some expenses reduce or disappear completely in your dream life. If you spend $3,000 a year on commuting to your 9-5 but you hate it, take that off – it doesn’t feature in your dream life. If you repeat this exercise with all of your expenses, you will soon get a clearer picture of not only what your future lifestyle will cost, but also how life will look on a daily, weekly and monthly basis. When I did this exercise, we decided we wanted to eat out 4 times a week (we both love food and we love not washing dishes even more! ), we pencilled in 4 vacations a year – one of them in really top-notch hotels. We also included budget for giving to friends and family as we had always dreamt of being ‘that couple’ that always pick up the check at dinner. Going through this process can also be a really great way of identifying where you and your partner might differ on how you see the future. My wife is a bit of a home bird, where as I love to travel. As a result, we had to make a couple of compromises as we planned out our future life. If you are in a partnership, I highly recommend doing this exercise together. Both of you need to be aligned on your goal to make this work. Once you have added up all of your dream life expenses, what do you see? Does the number scare you a little bit? It probably does, but that’s ok. Most goals worth shooting for are a little scary at first. You can use this number to figure out how you can achieve Financial Freedom and live the life you actually want to be living. First, you can focus on your monthly or yearly income requirement. Let’s say you have decided that your dream life will cost roughly $5,000 per month. You could use this as a target and look to start a business that you love to create this level of income. You could also think about creating a passive product business that could generate this level of income. Clearly these things are easier said than done. Many people will give up at this point. They will assume that the number is too big or that it is impossible to achieve their goal. They couldn’t be more wrong. The FIRE (Financial Independence, Retire Early) community is chock full of people who have gone against the status quo and are now reaping the benefits big time. These people are living their dream life in their 20's and 30's and have achieved financial independence. The key is to visualise your dream life so you can see the benefits of living it. You have to believe that it is possible to achieve (and it really is – believe me). I wrote last week about your mindset – you might also want to have a look at my 7-day Fast Track Financial Freedom e-mail course. The first day is all about mindset and how to think like someone who is Financially Free. You can sign up for the course below.